There have been several health procedures and even one minor medical emergency these past several weeks at the Crispy Casa, so no time for cooking up wondrous things for the blog. 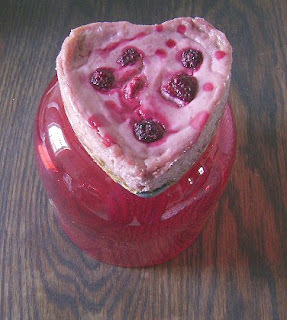 Everybody's fine now but aside from a fantastic black bean soup (tomorrow's post) there have been no spectacular Crispy Creations to pass on to you, except for this lovely little Valentine's Day edition of a raspberry cheesecake. Once she was feeling better, my little one requested some spaghetti and meatballs for her recovery meal followed by a slice of Raspberry Cheesecake. (Add more frozen raspberries and raspberry jam to that Lime Cheesecake recipe). Now, that's a decadent recipe we reserve for special occasions, like birthdays (see below photo for a particularly dressy example), and with the other members of our households not wanting to be tempted with a whopping hulk of a whole cheesecake lying in wait on the kitchen counter, I decided to make my honey a little single serving cheesecake. I have had a one-cup, heart-shaped spring-form pan-- a whim purchase I must admit, because it was so darn cute--- lurking around my cupboards for a couple of years and finally put it to use. I made up a small batch of my usual gluten-free graham cracker crumb crust (handful of crackers whizzed around in the food processor with 1 Tbsp. melted butter, 1 Tbsp. sugar, handful of walnuts) patted down in the base of this cute heart pan and then baked in a 325 degree F oven for 10 minutes. Afterwards, I approximated a single-serving cheesecake recipe by rinsing out the food processor and throwing in 4 oz. softened cream cheese, 2 Tbsp. Greek yogurt, a dash of vanilla, a few grains of salt, 1 beaten egg, 2 Tbsp. seedless raspberry jam, and a handful of thawed frozen whole raspberries, reserving a few raspberries to decorate the top. I whizzed that up, spooned it into my heart pan and then baked it at 325 degrees F for 45 minutes (I thought it would take much less, but the filling was not really firm and set until 45 minutes). I topped the cheesecake with some raspberries, tamped down a bit into the filling, and then drizzled with some extra raspberry juice for a little decoration. When my little heart was done, I let it cool for 20 minutes, then unsprung the outside and wrapped it in plastic wrap and chilled it in the fridge for 5 hours. My patient gobbled it down and smiled and tucked in for a cozy nap afterward. I have the slightest suspicion that your little invalid was milking her soft-hearted mother's sympathies! That looks beautiful! Hope the Crispy Crew are all fully recovered soon!